Engineers at GE Global Research are advancing motor technology that could have a substantial impact on hybrid and electric vehicles (EVs) of the future. 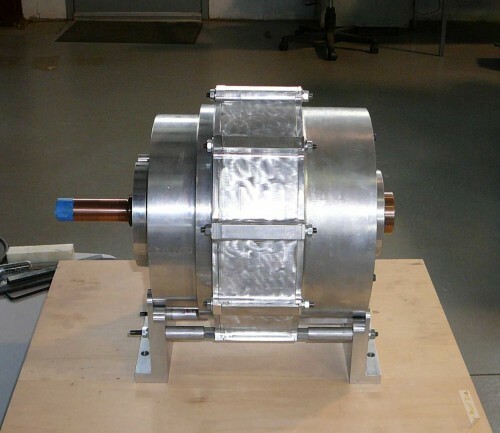 GE recently tested a prototype Interior Permanent Magnet traction motor, developed as part of a $5.6MM U.S. Dept. of Energy (DoE) project, that could help extend the range EVs and hybrids can travel before recharging or needing gasoline. Traction motors are the key part of the propulsion system that converts electrical energy into motion to drive hybrid and electric vehicles. Not only is the GE-designed motor less costly to make, lab testing revealed that it is more powerful and more efficient than what is on the market today. Combined, the additional power output and efficiency will help extend the range of EVs and delay the point at which hybrids switch to gasoline. Widespread adoption of hybrid and EVs will benefit from advancements, like this, in motor technology. Unlike conventional traction motors, which run at 65ºC and require their own dedicated cooling loop, GE’s motor operates continuously at 105ºC over a wide speed range (2,800 – 14,000 rpm at 30 kW) and can be cooled with engine coolant. Without the need for additional cooling lines, a hybrid will be lighter and cost less. GE has built several prototypes of this new motor. It’s been fully tested in the lab and demonstrated for DoE, but further testing must be done for reliability before commercial production is considered. Another important accomplishment of this project was the development of high-resistivity (3X) permanent magnets. This high resistivity will significantly lessen magnet losses and reduce or eliminate the need to segment the magnets. This will help keep costs down even more. A four-year project will follow-up on this work, as GE engineers set out to build a comparably performing motor with no rare-Earth magnets.